andrea joseph's sketchblog: what's new pussycat? Here's a couple I resurrected from the Graveyard of Abandoned and Unfinished Drawings. It's funny how you see things differently with some time and distance between you. I resented both of these when I was working on them. I resented the time and energy I'd put into them, and I resented them not turning out as I'd wanted. Did somebody say I'm getting old? Ooooof. You might like to click on the drawings to read all the nonsense that was going through my head when I was creating them. The top drawing is my response to the Everyday Matters Challenge No.49: draw your fridge. You can see more of my Everyday Matters responses HERE. I think your drawings are awesome. I love everything you do! andrea, i love them! so glad you are back and blogging again! They're beautiful to me. I wouldn't resent them one little bit! Love them both! The same thing happens to me, and I've learned to just stash a drawing away if I'm frustrated (instead of pitching it into the can). After a while passes, they sometimes look better to me! D'ya think you have enough chutney? And I'd say you do glass quite well. 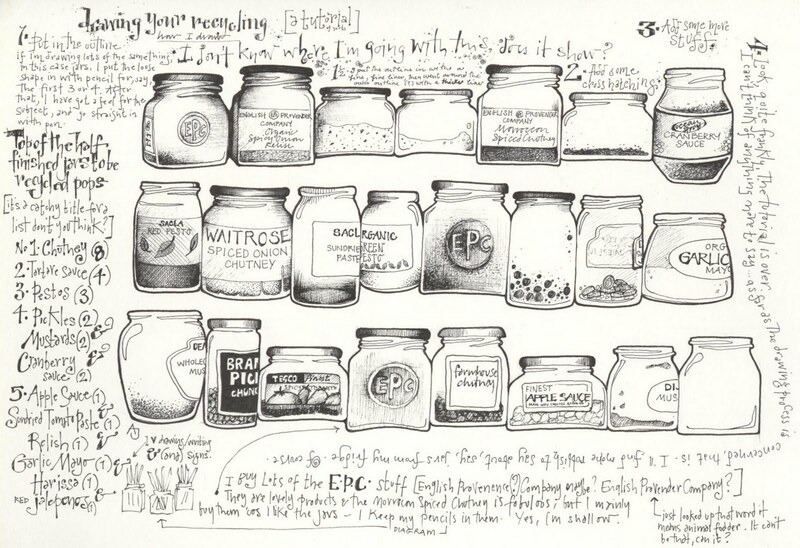 I'm impressed with the jars! Wonderful and love the comentary! I'm so glad you're back to posting again! These are both great! 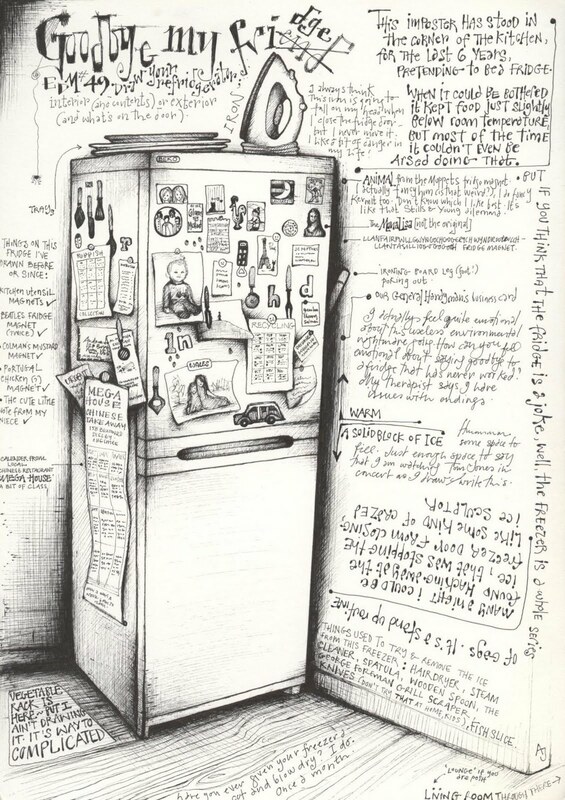 it would be great on my fridge! may be a little lack of shoes..
Andrea - So we can't expect a drawing of your vegetable rack any time soon then? Both of these are so cool! I love them and I am glad you are posting again. Love you sketches! Very cool! 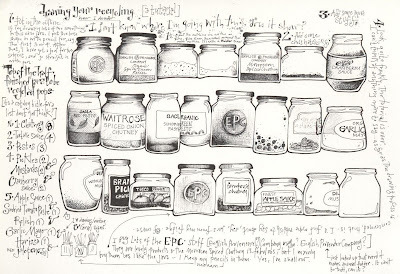 Not only do I learn about how other people draw but I learn that cranberry sauce comes in a jar across the pond!!! Aaargh! So when were you in my kitchen??? Ditto, ditto, ditto...the iron on top and board wedged in beside.... and the Stuff on the door... Thank God! I thought it was just me!! !